Nestled in the heart of the Aliso and Woods Canyons, you’ll find the ultimate in Californian cool, The Ranch at Laguna Beach. A short drive from downtown Laguna, the entrance is opposite the sparkling sea and tucked away from those who are yet to discover what is arguably the best place to stay in Laguna Beach. An unassuming driveway is flanked by the towering Californian Canyons, whose beauty is brilliant in the late afternoon light and leads to the main hotel entrance and valet parking service at The Ranch at Laguna Beach. The check in desk leads to the hotel’s on site restaurant, while to the left is the outdoor dining area complete with cosy fire pits, hotel shop and pantry and bar. The dining area looks over The Ranch’s stunning grounds, which spans 87 acres of land and an 9-hole golf course, arguably the Orange County’s most serene and natural setting, where Laguna locals come to enjoy their weekends. The Ranch’s naturally dramatic backdrop is indescribably beautiful; the kind that pictures simply cannot do justice, and the definitive of coastal cool. Fusing canyon with sea, the secluded hotel is the perfect place to unwind for nature lovers and ocean devotees alike. The rooms are rustic ranch chic at their finest, boasting rope chandeliers, stylish pieces of art and white panelled walls. The generous sized beds are the focal point of the room, with an intricately carved bed head, and a tapestry of throws and pillows offering a stunning contrast to the bright white ben linen. A walk in shower big enough for two is next to a twin sink with wood framed mirrors, brightly coloured wallpaper, above a wood and marble setting. The floors are wooden on entering the room; carpeted in the main bedroom, and it’s clear that every last detail of the room has been carefully thought out. Unlike other hotel rooms, where designers tend to stick to a consistent colour theme, the meticulous mismatched decor of the rooms at The Ranch are what make them so unique. A coffee-making machine, complete with a seriously good tea and coffee selection, and a mini fridge are the perfect touches for anyone wanting a morning caffeine hit. A flat screen TV perfectly placed on an antique-style green and gold sideboard is the perfect accompaniment to lazy Laguna mornings in bed. The outdoor patio complete with table and chairs offering unrivalled views of the nearby canyon is the perfect place to enjoy a hot coffee in the morning or a glass of bubbles as the sun sets, and you really are experiencing the best of wild and rural Californian life, without having to compromise on luxury or style. Tucked away near the swimming pool and hot tub, guests will find the Sycamore Spa. So called due to the plentiful Sycamore trees on site, it offers a sumptuous selection of facials and massages. Having spent ample time in the Californian sun, I opted for the anti-ageing facial and was shown through to the changing rooms where I changed into a cloud-soft robe, before being welcomed into the treatment room. After de-robing, ready for my facial, I made myself comfortable on what has got to be the most luxurious treatment bed I’ve experienced; while the wonderfully soft base and the perfect amount of layers were enough on their own, the heated blanket provided the ultimate remedy to the crisp and cool autumn morning outside. The facial lasted an hour, and begun with my therapist examining my skin, before working her magic on my sun-worn skin. I was cleansed, toned, exfoliated and steamed to my heart’s content all to the sound of soothing birdsong. A neck, arm and hand massage was also included in the treatment, and my hands were placed into warm mitts, leaving me with baby-soft skin as the treatment came to its end. My therapist finished the facial by applying a layer of Vitamin C serum (for sun damage), sunscreen, and lip plumper, and suffice it to say my skin was glowing by the time I journeyed back to my room. The on site Harvest restaurant is second to none when it comes to matters of the mouth. Their culinary focus is on honest, Californian comfort fare that showcases produce harvested on the property itself, with other fresh ingredients consciously sourced locally. The menu is seasonal and changes regularly, reflecting what is available from the half-acre Harvest garden. 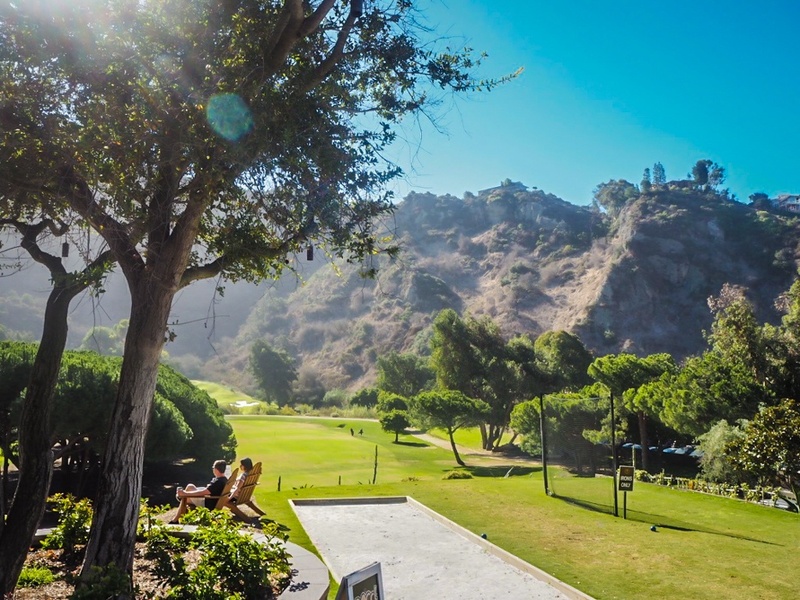 Offering both guests and Laguna locals breakfast, lunch and dinner, the food is as mouth-watering as the setting is serene, with a view to the Aliso canyon. Breakfast can be ordered to your room or eaten in the Harvest restaurant, and features the sort of menu to satisfy all manners of appetites. From steel-cut oatmeal to avocado toast, to eggs benedict and beyond, the fare is tasty, the service impeccable. If you have a sweet tooth, nothing will satisfy it quite to the degree that the freshly baked cinnamon rolls with bacon will; sticky, sugary and doughy-soft, they really are the height of indulgence. If you fancy something more nutritious, the 24 carrot and green goddess juices are a great way to kick-start your morning. Boasting fruit and veg aplenty, they’re a sure-fire way to get your five a day, without sacrificing on taste. Dinner is a lavish affair in a homely setting; with open fires, dim lighting and cocktails flowing. On our first night we ordered a selection of shared plates, as well as a starter and a main course. I began with the shrimp cocktail made up of black tiger shrimp, sundried tomatoes and horseradish, avocado mousse and curried almonds, it was easily the most elegant prawn cocktail I’ve ever eaten and followed it with the mouth-watering scallops and bacon, laid on a bed of parsnip puree and chestnut-brown butter. The sides we shared were brussel sprouts, served with sweet chilli sauce, pecan and green apple, and the pimento mac and cheese; carb loading and its very best. We were treated to Harvest’s famous Skywalker Winer Dinner, a four-course foodie affair paired with wines from George Lucas’ vineyard. We started with Apples and Frisée with Moody Blue Cheese, followed with Roasted Loup de Mer with Beluga Lentils; the third course was Salmon with Crispy Polenta, Rocket Arugula and Tomato Gravy, with a desert of Chocolate Banana Bread and Butter pudding. Truly a dinner fit for a king. Evenings at The Ranch are the sort that make you question whether you’ll ever want to leave the grounds during the entirety of your stay; despite the proximity to the Pacific Ocean and the free shuttle buses that take guests into downtown Laguna. As the sun begins to set, casting a golden glow over the Canyons, the temperature cools and the fire pits begin to roar. Local musicians play nightly at The Ranch, treating guests to the perfect fusion of country music and Californian cool – think renditions of Bob Marley and Ed Sheeran, accompanied by acoustic guitars and melodic tones. Guests can enjoy The Ranch’s generous selection of drinks from custom cocktails, utilising ingredients fresh herbs from the garden and other indigenous ingredients, to full-bodied reds and sparkling prosecco. As night begins to fall, there truly are few better ways to end the day. If that’s not enough and you fancy something sweet, treat yourself to a true American tradition and indulge in a s’mores board with a glass of cognac. Toasting marshmallows in the dark of the night, before sandwiching them between graham crackers filled with chocolate and you really are living the American dream. Achingly cool with the kind of laid back vibe that makes you feel immediately at home, The Ranch at Laguna Beach really does have it all: rustic-chic interiors, wild and beautiful grounds, and an endlessly delicious food and drinks menu. Off the beaten path in every sense of the world; once you step foot through The Ranch at Laguna, you won’t ever want to leave. The Fit Traveller was a guest of The Ranch at Laguna Beach for this stay. As always, the opinions, words and images are authentically our own.